It’s not often that artists keep records that document an entire 60 year long career. John Addyman did just that. 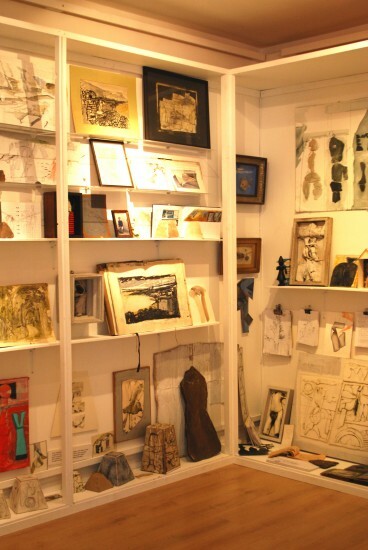 Apart from paintings and drawings, collages and prints, ceramics and sketchbooks which his family has discovered, there are intimate thoughts, workings out, observations and reflections, numerous writings and note books. What shines out of his sketchbooks in particular are his wit and humour, his knowledge of art and life, his integrity and his passion. In 2007 we decided to create a database of the work with the intention of keeping a record for National interest and a book publication. This work is ongoing. John Addyman’s work is to be found in both National and International collections, from the Victoria and Albert Museum and Government Art Collection to the L’Eisenfeld Antwerp and the Luxembourg city Museum. A recent purchase of work was made by the National Library of Wales and we hope by creating new exhibitions that we find homes for much of the work to safeguard it for future generations. The executors for the artistic estate for both Madeline and John Addyman and contacts for the collection are Harriet Addyman and Mr Nicholas Elam.